Drink Local - Local beer showcases coming soon! Just a quick post to let the google robots that read my site know that I am planning a few posts aimed at local breweries and their core range of beers. I drink a lot of beer but it's not always local or Australian. There is nothing wrong with this as I've never been shy about the fact that for me the beer journey is about unique beer from anywhere but I would like to show off some more local beer both from Brisbane and other parts of Australia, especially those with core ranges to entice new drinkers. So sometime in the next couple of weeks I will be starting a new feature for these local beers, starting with Mt Tamborine's Fortitude Brewing \ Noisy Minor . 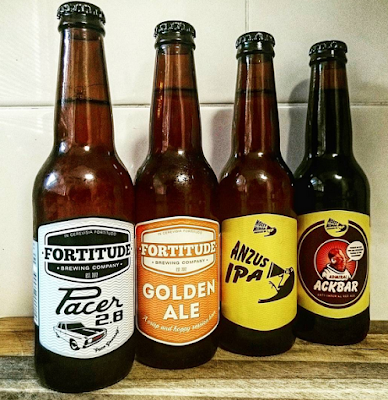 Fortitude's current core range consists of Pacer (2.8% abv), Golden Ale (4.3% abv. ), Anzus IPA (6% abv.) and Admiral Ackbar (8.5% abv). I will be doing a review of each beer and also offering some food recommendations and possibly a recipe. This idea will continue with Newstead Brewing Co. and later Green Beacon and I may try and get my hands on some other local bottled beer to review or move on to core ranges of Australian craft beer.